The sweet-sounding waves and the pristine warm sand is a well sought-after holiday destination for a quality respite from the bustling city life. 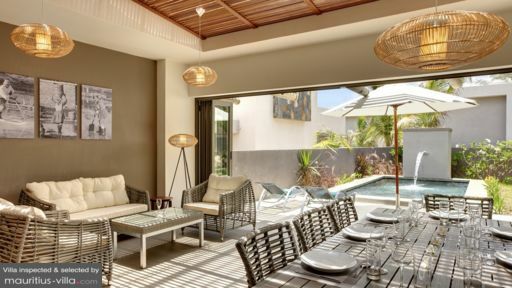 Tucked in the pristine village of Trou D'Eau Douce on the East Coast of Mauritius Island, Villa Stylia Garden can provide just what you need, with a bonus private garden to add on to the pleasant scenery that nature offers. It’s proximity from the sea is so close that you can even sleep and wake up in your own bedrooms and still hear the soft crash of the waves. There are 3 cozy bedrooms in Villa Stylia Beach, all equipped with a spacious en-suite shower rooms. 2 bedrooms are on the top floor; one of them is furnished with a double bed and with a glass window which boasts the view of the tranquil sea and even a glance of a mesmerizing sunrise to start your mornings right. The other room has two bunk beds which can sleep 4 guests. The last bedroom is located downstairs, equipped with two single beds which can be merged to form a double bed. In Villa Stylia Garden, a private outdoor garden and a dainty pool is situated on the frontier of every villa. 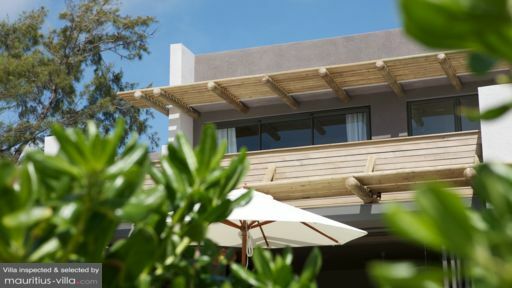 Spend quality time under the sun with your family and friends as you take a dip in the pool or suntan on the sun loungers provided on the shaded terrace. You can open up the sliding glass doors to have an unobstructed view and access to the living area for a bigger space to bond with your company. The living space merges the 2 couch areas and the dining table in a compact area on the first floor. The interior of this villa is refreshingly furnished with chic-styled furnitures matched with hanging oriental fluorescent lights, creating a cozy atmosphere that will keep you fresh and rejuvenated. The space is also surrounded with paintings and photographs that showcase different labor jobs that Africans do, giving you a taste of their brief culture in East Africa. You can choose to slide the glass doors open to overlook the beauty of your private garden and dainty outdoor pool. Villa Stylia Garden proudly offers quality service from a team of dedicated staffs to make you feel at home. An in-house mobile phone will be provided during your stay for easier contact with our on-site staff. Cleaning up of the rooms are done daily, for 2 hours. 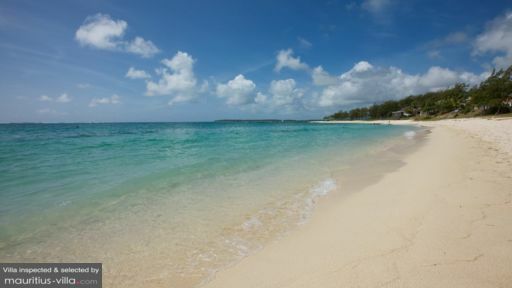 The Villa Manager will also be happy to help you orchestrate and maximize your holiday in Mauritius. Should you wish to experience a private local cuisine meal in your villa, a professional chef will be available upon request and at an additional cost. For a BBQ experience, you can also ask for the chef and he can help you set up a home-based BBQ and serve it hot and tasty! Just a one-minute walk and you will reach the beach where you can take morning strolls to witness the beautiful Eastern African sunrise. Explore the island of Trou D'Eau Douce where you can take Catamaran ride. Explore hidden gems such as the Grand River Waterfalls or just hop onto another nearby island for more relaxing and sun tanning experience. If you are feeling a little more adventurous, you can also try Kitesurfing which is recommended if you are travelling around June to September when the winds are cooperative for this exciting sport! The beach is beautifully covered with coral reefs which calls for a fun snorkelling time with your family and friends. The beach side is also shallow and is therefore appropriate for children to play in as well. You can consult your Villa Manager for more details, to make your holiday fun and worthwhile.